LANmark-6A EVO Snap-In Connector is a screened RJ45 cable jack specified up to 500MHz. It is designed specifically to support the high frequencies required for 10 Gigabit Ethernet, but is also fully backwardscompatible with lower frequency applications using the RJ45 interface. LANmark-6A EVO uses a fully closed rear cover, which provides 360° screening and excellent coupling attenuation to ensure immunity from alien crosstalk and other external interference. Cabling channels with LANmark-6A cable jack have not to be verified on site for Alien Crosstalk, as this new 10G parameter is met by design. This reduces significantly the cost for 10G networking. The LANmark-6A EVO has outstanding electrical performance up to 500MHz especially for NEXT/FEXT, Power Sum NEXT/FEXT, Return Loss and all screening parameters. 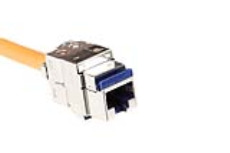 This enables to achieve high performing Cat 6A channels as well as very short link and channel configurations needed in data centres with up to 3 connection points within 10 meters. LANmark-6A EVO makes use of Nexans wire organiser and is therefore very easy and fast to terminate. Using the Nexans comfort tool installation tool EVO Snap-In series is re-usable. A stranded version is available to allow the use of flexible stranded cable in cross connects or consolidation point. The LANmark-6A EVO fits in all structural hardware designed for the EVO Snap-In range and can used in all positions of a 4 connector twisted pair cabling channel (PP, CC, CP, TO). When installed in combination with other LANmark-6A components, a 25 years channel warranty can be obtained, covering full 10GBase-T support and full Cat6A/Class EA compliance.